Line 700 was produced by Consolidated Glass Company in 1929. 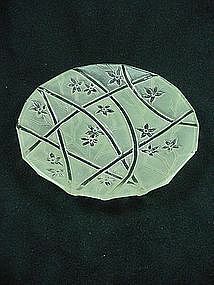 This is the #709 bread & butter plate in Green ceramic. (the color is a green ceramic finish fired on crystal.) 6 inches in diameter and excellent condition. See my other listings for more in this pattern, or email for other Consolidated pieces you're looking for.